It’s been two days and my legs are still sore. The bruise on my right big toe is still tender. After returning from a weekend backpacking trip with my Boy Scout troop, I was in pain. My neck and shoulders were stiff and sore. My lower back was tense. My knees were revolting. What had I done to myself? I was in good shape, I exercise often, and I frequently go backpacking, so what was so different about this weekend to put my body into such misery? 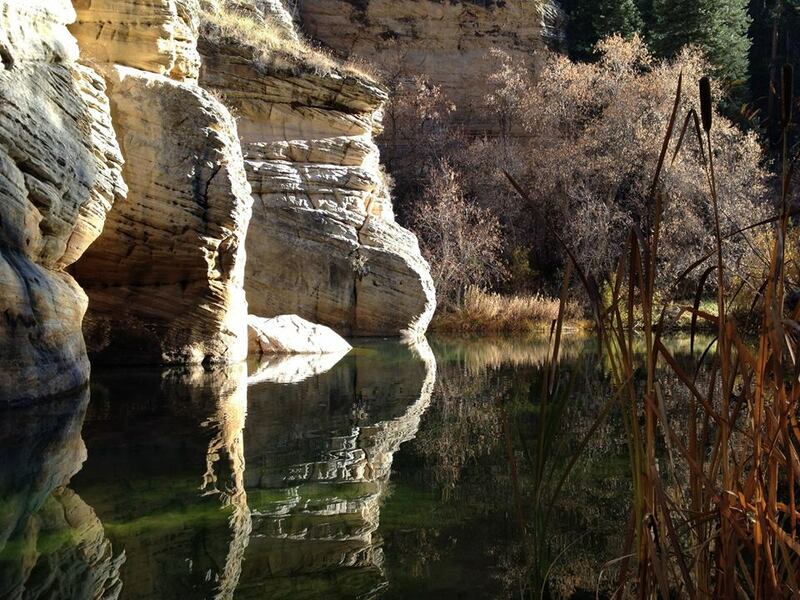 Our plans put us into the east end of West Clear Creek in northern Arizona, following the Maxwell Trail #37. The trail to camp was only a mile (according to my GPS device), but it did descend 1,000 ft (305 m) from the trailhead to the canyon bottom. I had backpacked this this trail before, and while it is rocky and steep, I wouldn’t consider it terribly difficult. At least not with a lightweight pack. This time was different. I was heavy. I’m only smiling because we’re so near the trail head, and the end of my misery. Since returning to Boy Scouting as an adult volunteer, my pack weight has dropped considerably. I started off with a traditional pack weight with the “Big Three” items (backpack, sleep system, and shelter) each weighing close to 5 lbs (2.25 kg) each. I now take trips where my entire pack weight for a typical weekend trip (including food and water) is between 15 and 17 lbs (7 and 8 kg). 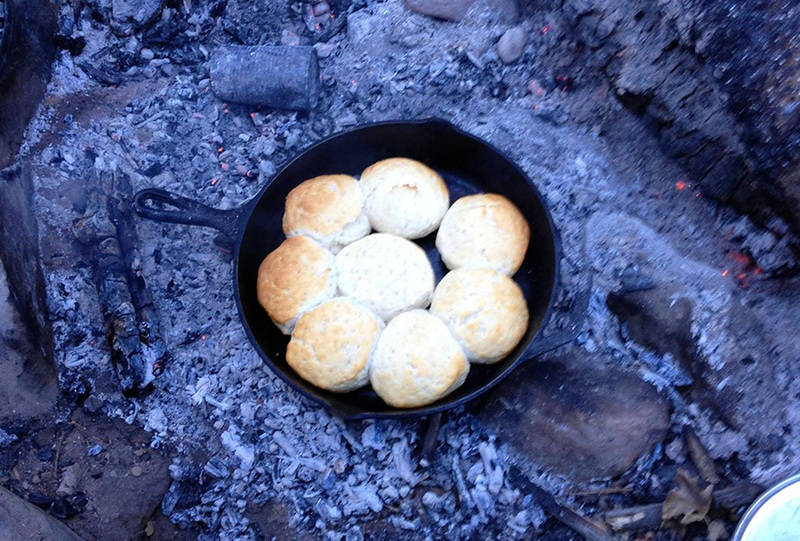 For this trip, I thought I would “treat” the scouts with a surprise breakfast and lunch, which necessitated bringing a few “heavy” items, including a cast iron skillet and Dutch oven lid (about 17 lbs/8 kg). I also lugged a gallon of milk (9 lbs/4 kg) and the food required to feed 8 for two meals (about 8 lbs/3.6 kg). My first problem was finding a pack that would hold it all. I have all but eliminated all my high-volume packs because my lightweight gear packs down so small. My current pack is a Gossamer Gear Gorilla, and while I could have probably fit everything in the Gorilla, the material isn’t designed for weight more than 35 lbs (16 kg). I needed something bigger and more durable. Thankfully, I still had my external frame pack from several years ago that I now only use during pack demonstrations with the scouts. It’s practically brand-new, having only been used a few times before I abandoned it for lighter options (the pack is 5 lbs (2.25 kg) empty!) The external frame was great for type of gear I wanted to carry, but I questioned my decision after trying to hoist it. My calculations put my pack weight at more than 50 lbs (23 kg). 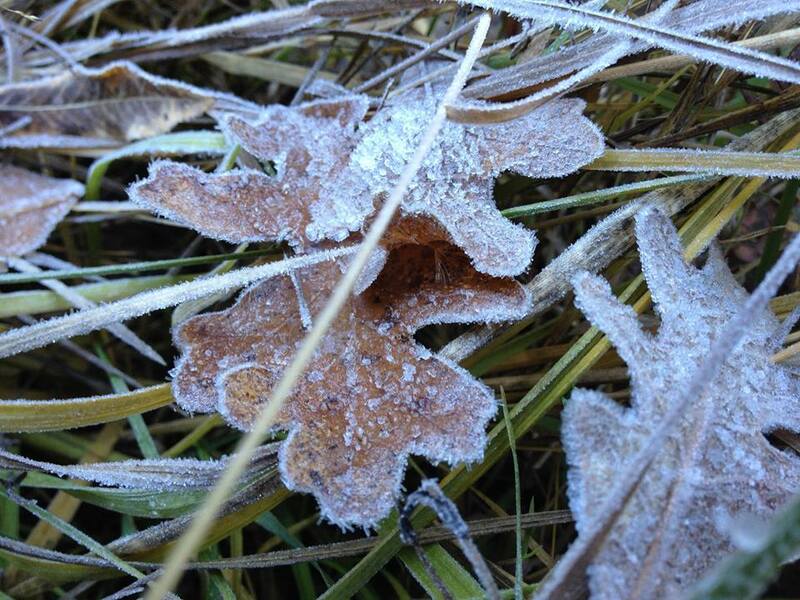 Overnight temperatures in the canyon were in the upper 20s°F, leaving a beautiful frost as evidence. My knees were the first to groan under the weight. Every step was miserable. For the entire hike to camp all I could think about was, “Why do people do this to themselves?” Because of the heavy pack, I had to use my heavy-duty hiking boots with stiff ankle support. I was glad to have them, yet I longed for the maneuverability and breathability of my trail runners and sandals I typically use with lightweight packs. As I continued to descend I could feel my toes jamming against the thick leather of my boots. I’ve been lucky to have had very little foot problems such as blisters or hot spots while I hike, but the added weight in my pack was having an immediate effect. 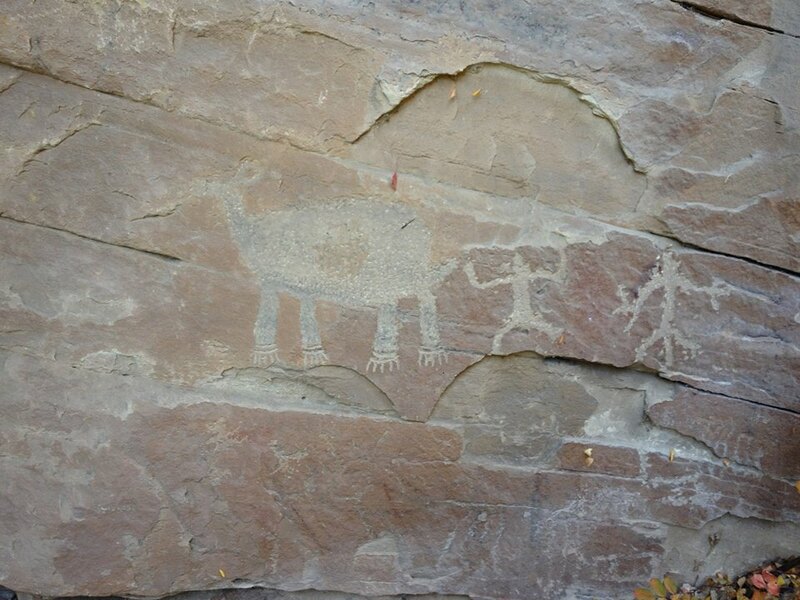 Just a few of the hundreds of petroglyphs we saw etched into the canyon walls. Another challenge I noticed was balance. An external frame positions weight differently than an internal pack and it isn’t the best for scrambling or lateral movement. I had to hike slowly and carefully, watching every step, and being careful not to get unbalanced. The trail posed problems that I hadn’t noticed with a lighter pack as I had to round switchbacks differently and slowly navigate obstacles like fallen trees and large rocks. With a lighter pack, I could literally jump and high step over such terrain, but my knees and legs wouldn’t take that abuse with the weight I was carrying. My deluxe accommodations for the trip: A Hennessy Hammock, complete with a Monsoon tarp. I was so grateful for a comfortable night’s sleep, I almost forgot I had to pack out all my heavy gear. To some, 50 lbs (23 kg) doesn’t seem like much. I have scout leaders who routinely boast of carrying 60 or 70 lbs (27 to 32 kg) in their backpacks. Was I just being a wimpy kid? As I hiked I thought about training with 50 lbs (23 kg) to “get in shape” so I could bear it better. I audibly laughed. Why? Why burden myself when I can be equally equipped but with lighter gear? With a lighter pack weight, I enjoy the hike so much more. I am more nimble around obstacles. My body is more responsive. I can “stop and smell the roses” instead of “stopping to catch my breath.” Less weight means I can meander and still cover more miles and not be exhausted at the end of the day. I’m also less prone to impact injury. I quickly dismissed the idea of “getting tough” with more weight. There are no winners in the “who can carry the most weight” competition. Once we made it to camp and I was able to dump my gear I felt so much better. The rest of the trip (sans the pack) was enjoyable. We explored the creek, visited some petroglyphs, and basked on pebbled beaches when the sun came out. The scouts (and leaders) were excited not to eat instant oatmeal in the morning. Instead, we baked buttermilk biscuits and homemade sausage gravy that was delicious. For lunch we cooked up tortilla pizzas. My pack weight was considerably lighter hiking out, having dropped 10 lbs (4.5 kg) in consumables, but I wasn’t out of the woods. Hiking out of the canyon was a slog. I haven’t taken so many rest stops in years and my heart rate was high throughout. As we reached the trail head, I considered whether I would do this sort of self-inflicted punishment again. Carrying the heavy weight was a good experience because it reminded me why I never want to do this again. I can understand why people dislike backpacking if they have to carry these kinds of loads. I also thought about my scouts and what they carry and I felt a great deal of empathy for them. Most expert opinions recommend carrying around 20 to 30% of your body weight in a pack. For a 115 lbs (52 kg) scout, that equates from 23 to 35 lbs (10 to 16 kg), which doesn’t sound like much, but for a 200 lbs (91 kg) adult, that is 40 to 60 lbs (18 to 27 kg)! If 60 lbs is heavy for an adult, than 23 lbs would feel about the same to the smaller Boy Scout. Lightweight backpacking recommends going even lighter, to the 10 to 15% range, making that 23 lbs (10 kg) melt into 12 lbs (5 kg). I won’t describe how to pack lighter in this post, but there are dozens of authors who have written books on the subject of lightweight backpacking. The key point for me was to work with my scouts to help them reduce their pack weight significantly so they can enjoy these trips more. Was the cast iron worth it? Maybe. At the time, it was the best option I had to feed as many people in the most efficient manner in a short notice (I really didn’t want to eat instant oatmeal if I could help it). If I ever do this again, I think I will invest in a Fry-Bake pan or other lightweight option. Backpacking heavy gear, even for short distances, is miserable. In fact, it’s a pain in the neck. Well I got a good chuckle reading this….if you have backpacked any at all you have said to yourself “why in the world did I take this??? ?”, but I do have to say the Dutch Oven is waayy over the top! Oh, I said that to myself a few times. 🙂 I’ve often wondered what sort of reaction I would get if I ever pulled a Dutch oven out of my pack. Well, now I know: sore shoulders, stiff neck, aching knees, and bruised toes 🙂 I doubt I’ll ever bring a skillet like this again. I always take a luxury with me, but a dutch oven lid and a skillet!! I hope the troop enjoyed the breakfast treat! I’d suggest the issues with balance directly relate to wearing boots with “ankle support”. read: “ankle restriction”. The modern soldiers boot really isn’t designed for practicality or ergonomics. They stop your feet from being able to do the job they’ve evolved to do. Any ankle rolling is locked off at a narrow angle causing the whole system to break down and you to be left unable to use the full travel of the joint to maintain balance. Yes. I’m not a fan of “traditional” backpacking boots, preferring light trail runners or sandals instead. Nice account of why we don’t to that any more! Eeks! It was sweet for you to do, though, and I’m sure that the teenaged boys (eating champions of the world) appreciated it. As for your “others have written about ultra-lightweight backpacking” argument, true, but they haven’t written about ultra-lightweight *hanging*. I want to know what your super lightweight hammock setup is! Derek, 2 words: Outback Oven. Fraction of the weight and bakes just as well. Don’t take mine often backpacking any more but if I want to cook it’s the first thing I grab. I’ve used that kit once, on a backpacking trip on the AT in Virginia with the scouts. The adults cooked separately on that trip and we pulled all the stops: muffins, biscuits, and brownies. It’s just a cover, correct? We also had to pack in a separate stove (we used an MSR Whisperlite). I don’t own one 🙁 but it is something to consider. There is a UL version that is just the cover and the full kit with frying pan, lid and cover. You do need a stove but even so it would be lighter than the Dutch oven lid let alone the cast iron pan and all. I was just checking them out. I’d like to get a larger frying pan. I have an 8-inch aluminum version, but I want something that has a lid that can take heat/coals. The Outback Oven solves that with a convection oven system. The Fry-Bake is more Dutch oven style where you burn a “twiggy” fire on top. I imagine that the cover and convection oven is easier. Excellent article. However, what to do for those of us backpacking with our younger kids that can’t yet take a load? We become the ubiquitous “sherpa dad”. I’m currently using an old external frame with a sil-nylon large (LARGE!) sack to hold our gear and a small daypack strapped on for incidentals. Any input for those scenarios? This is a great subject for an entire blog post, but I’ll try to simplify my answers here as much as possible. I’ve got a few kids myself and I still love going out with them, so I understand your concern. There are some great articles on the web about backpacking with kids, so I don’t want to duplicate anything here, per se. In my own experience, backpacking with infants still in diapers is not pleasant. Yes, it can be done, but it is much more difficult, not just in the care and maintenance, but in the gear required. When we take the smallest of our children, we stick to car camping. Hiking is another matter. I take everyone hiking, but if I have to carry a child, it limits how much other gear I can haul and where we can go. For backpacking trips with older children (so long as they can walk and take care their own needs reasonably well) I recommend always having a child carry something, even if it isn’t a lot. A small day pack with snacks and a water bottle may be all, but it helps share the responsibility and keep everyone involved. If I’m truly backpacking with my kids, I mitigate the risks (and the load) as much as possible. I want the experience to be pleasant so they will want to join me in the future. Shorter hikes and pleasant conditions for younger kids. My older children have done more ambitious treks. When they were 7 and 8 years old respectively, we did a 4.5-mile backpacking trip together in January. Each carried a pack that weighed about 8 lbs (3.6 kg) (consisting of clothing, water, and sleeping gear). All of us carried lightweight hammocks and quilts and shared a tarp that I carried. My pack weight wasn’t much over 17 lbs, and there were a few times on the trail that I carried both their packs. But even then, the combined weight was roughly 30 lbs. With everyone using lightweight gear, it has a net effect. Yes, I end up being a Sherpa Dad on occasion, but it doesn’t mean I have to break my back. As a dad, you’ll be the best to know what your child can handle, what their needs are, and what you may have to bring to make the experience enjoyable and memorable in a good way. If that means carrying a little extra, than so be it. Ribz frontpack are cool. Some similar type ideas, noticed packs the other day with front pockets hanging off the shoulder straps. Also there is military Load Bearing Vest, or fishing/photo vests… Putting some weight forward helps. I love the way you described it. I myself became a heavy packer in the past couple of months due to some circumstances and I carry around 20kg. I am in a much poorer physical shape than you but have no issues due to the rucksack I am using – it has some additional features that allow better regulation on the belt, shoulder straps and compression. This one can sustain a load of up to 35kg (tested), it is 80+15 litres and everything is in two main compartments. With the Kentaurus the only thing that suffers in my case are my legs, which need to carry my own 100kilos plus the backpack. But hey – the things we do for family. 😀 I think a bigger rucksack with an internal frame is more comfortable in such circumstances. I keep hearing great things about the Paradox packs. How they can handle a heavy load but at the same time, slim down and be nimble when carrying light loads. However, I’ve got a family to feed so spending 400 on a backpack isn’t really in the cards. Derek, I do think you are right when talking about your kids carrying some of the load, namely light stuff. My daughter just turned 7 but she is quite skinny and so most pack belts do not grab her waist at all. I too was thinking of starting her off at 10-15% of her weight just to see how she does. On BPL, Daryl Daryl has posted his carbon external frame that weighs 7 ounces. It uses a thin hipbelt, dual carbon (kite spars) stays and some shoulder straps. From there, a lightweight bag is clipped to the top of the frame. I may give this a try for her as A. It’s cheap, B. It’s VERY light (thus more carrying capacity for her to actually carry stuff and not just a pack) and C. It’s cheap. If the experiment doesn’t work out I can ditch the idea and be out 15-20 bucks. Not too shabby. Let me know how it goes. Sounds interesting. Finding good packs for small children can be tough. To me, your “toe jamming” is indicative of boots that no longer fit you. I do appreciate you used what you had – have you looked at any of the recent light weight hiking boots though? – I have found my Asolo Creeks to be the most comfortable boots ever, taking a lot of inspiration from minimalistic footwear. At the end of a day in the hills my feet no longer feel like lead blocks! Dave, you make a good observation. 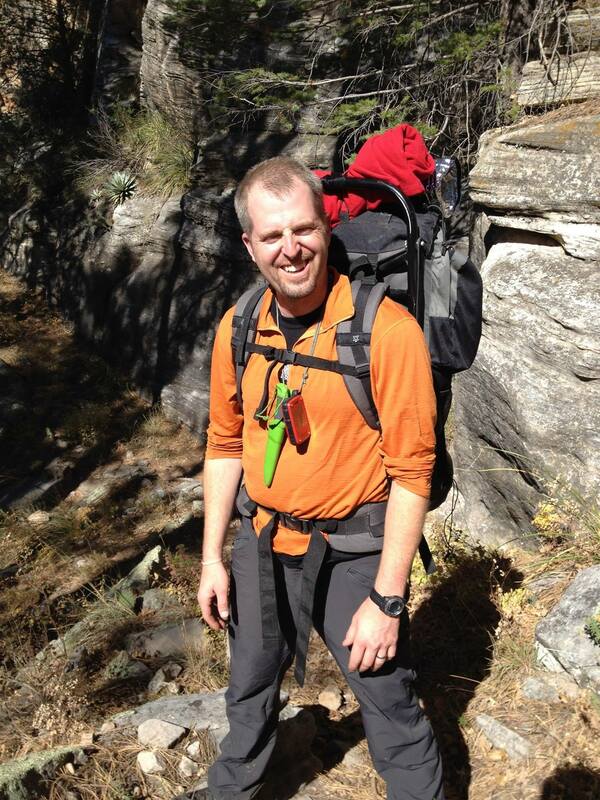 I’m typically a lightweight to ultralight backpacker and prefer light trail runners or sandals when I hike. My normal pack weight (with a weekend of food and ample water) is 17 lbs (8 kg). I think the Dutch oven I carried on this trek weighed that much by itself! Ug! I have a pair of Teva sandals that I wear nearly year-round, so long as there isn’t snow on the ground. With a lighter pack, I can use lighter foot gear and move fast. In contrast, when carrying heavier gear, you need more support for your feet and ankles. I would say that my feet, ankles, and legs are stronger thanks to years of hiking in lightweight footwear, but I think I made the right choice with my sturdier boots when I hauled the heavy pack. The boots I wore on this trek fit fine, but there are other factors at play that contribute to the “toe jamming” problem. First, I could have tightened the laces around the bridge of my foot to keep my toes from sliding forward too far. Ultimately, the pack weight and the steep, difficult terrain would have minimized any positive benefit from lacing. How did the Hennessy hold up for this outing? Did you find it was the right hammock for this hike compared to other hammocks you own? It looks like there’s an underquilt on underneath there. What type did you use this time out? The Monsoon tarp looks nice and wide, enough to cover everything complete. Thanks for the post. I’m currently testing a few if the new Hennessy models so I took one on this trip. Was this the right hammock for this trip? Sure, but a number of hammock configurations would have been just as good. The monsoon tarp was great. I really like it. Although it is small compared with other winter/full coverage tarps, it provides plenty of protection and packs well with the hammock. I did use an under quilt and I think the bubble pad as well. The pad doesn’t warm up as quickly as the down under quilt but I liked the extended foot and leg coverage since I was using a 3/4 under quilt. Great article–thanks for being the lab rat for this painful experiment. I too am a Scout leader who has accompanied our scouts on yearly week-long hikes on the A-T. I’ve been a Hennessey Hammock hanger since 2002 and will never go back to sleeping on the ground. I am something of a warm weather weenie, however, as I’m not fond of sleeping in a hammock in cold temps. What underquilt do you use for the HH? Does HH make the monsoon tarp, or is it from another company? As far as cooking for groups on the A-T, our troop follows this meal plan. For breakfast, everyone is on their own. Breakfast for the boys is often Pop-Tarts or granola bars. Some of the adults do the instant oatmeal. Lunch is on your own too, although we encourage everyone to have a “lunch buddy” so that you don’t have to eat an entire 8-ounce Crackerbarrel cheese or a 6-ounce Beefstick in one sitting by yourself! Dinner is a hot meal. We typically have about 6-8 participants for these hikes, so each participant is required to prepare and dehydrate a dinner to feed 8. We have a Whiperlite or Simmerlite stove and a lightweight pot set consisting of a 2 and 3-quart pot for the group. With this setup, everyone in the group need not carry a stove and fuel. Each night someone takes their turn to cook their meal. We typically have the newest hiker cook the first day, or the day of a re-supply. If we have a larger group of say 12 to 16 participants, we have 2 dinners each evening. We typically don’t do any baking, although I have made Jiffy banana muffins in a kind of a double-boiler setup with our 2 and 3-quart pots. I have made scrambled eggs from egg powder and boiled them in a freezer bag, so there was no mess to clean up. We’ve seen other groups who have each participant cooking their own dinners separately, so each has to bring a pot, etc. Even if you’re sharing the same stove, this just seems wasteful to me because you have to run the stove a lot longer to cook all the individual meals. Besides, there is just something about enjoying a meal together at the same time that adds to the camaraderie of the trip. Scouts travel heavy for a number of reasons. First, lightweight gear can be expensive, regardless of what many bloggers might say. Not many troops have the budgets to be able to afford $500 Tarptents and there are plenty of Scouting families that have a hard time justifying a $250 down sleeping bag. Secondly, lots of scout parents have this “just-in-case” mentality about packing for contingencies. 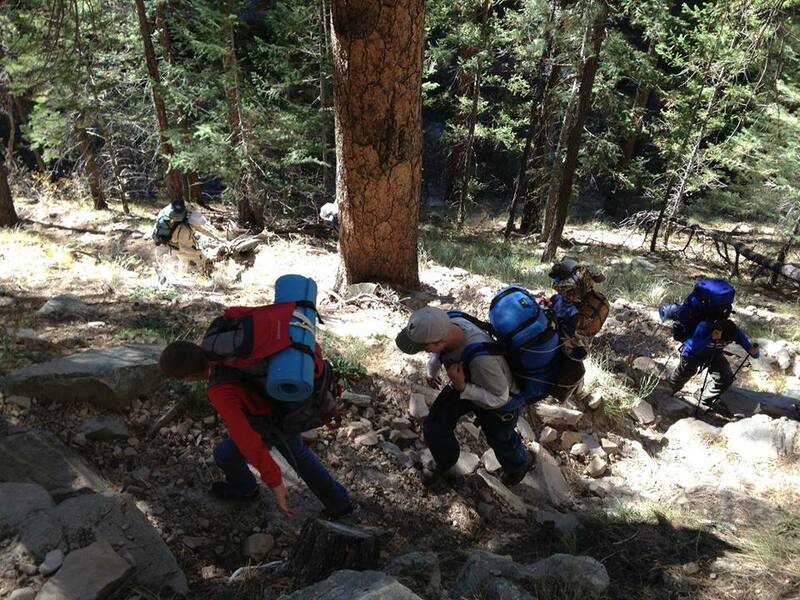 They needlessly fill their boys’ packs with extra clothing and other gear that they think they might need. As adult leaders, we try to jettison as much of this extraneous gear as we can, but some of it still trickles through! Sometimes the boys let their machismo get the better of them. If they got a new K-bar survival knife for Christmas, they’re determined to carry it (or the weather radio!) on the trail. Bill, thanks for the great information on your experiences! We do things fairly similar to you in regards to meals and responsibilities. As for my under quilt, on this trip I used a down-filled 20°F Phoenix from HammockGear.com. The Monsoon tarp is from Hennessy. It is smaller than I expected from the description on the site, but I’m very happy with it. It fits my philosophy of having just enough and not more than necessary. All of the Hennessy tarps are meant to “hug” the hammock for maximum protection. This means that, for a “winter” or full-coverage tarp, it isn’t exactly spacious. Bill, I believe the ” lots of scout parents have this “just-in-case” mentality about packing for contingencies” is taking the Be Prepared a little too far! I know I was guilty of it at their age (and still sometimes now…) so I make sure when training for expeditions we thin down what they really don’t need. Derek, what sort of temperatures have you taken your hammock down to, I am in the UK, so climatically a little different, my Hennessy has been great in the summer but I would not want to sleep later than the end of September from what I have experienced so far. I am currrently researching insulation systems and seem to be drawn to the HHSS but still deciding, your thoughts and suggestions would be appreciated. The coldest I’ve slept in my hammock is -5°F (-20°C). It’s rare to get that cold here in Northern Arizona; most of the time it is in the teens. A friend of mine took the Hennessy Super Shelter system down in the -20s°F (mid -20s°C) and was toasty. I’ve not had the opportunity to try that system so I can’t speak directly to it. However, you can experiment with pads and reflective bubble wrap as a low-cost solution. If you have pads used with tent camping (e.g., Thermarest, etc.) those work great for staying warm in the cold. I like the extra width of the green military closed-cell foam pads, or I use a half pad, turned sideways, to give me full shoulder protection. Folks have used pads into the teens (myself included) and been fine. I see from the comments that many of your readers are cautious of using a hammock in cold weather. I have been following your friend Shug Emmery and the Hammock Forum and see where they purposefully wait for the temperature to reach in the – 20’s F and lower before even going out. Most live in Northern USA. They all use Good Underquilts and now the Pea Pod system and seem to not just make do but actually be toasty. I think a hammock is better than ground camping since their is no cold ground sucking up your warmth. 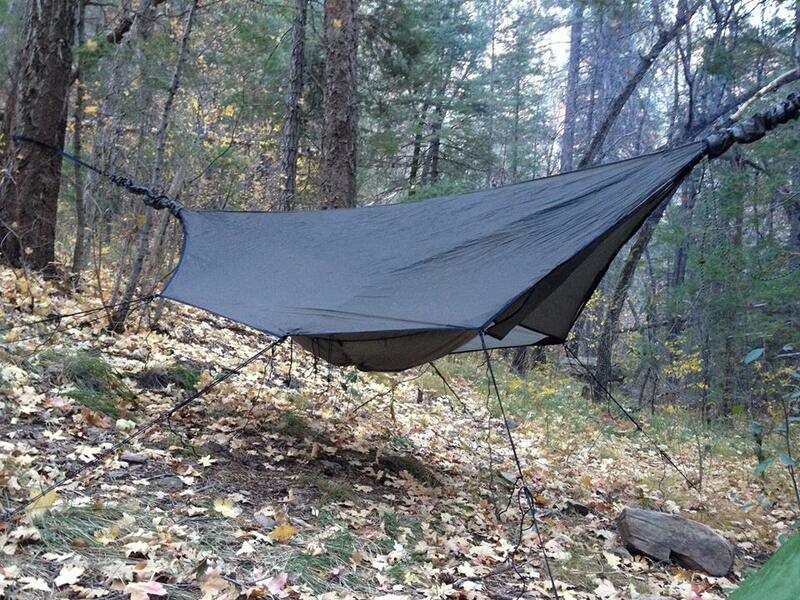 Using an insulating underquilt and wind protector will keep the heat you generate in place. I’m about to take a leisurely trip on the AT again, did a thru hike in 2010, and I definitely agree. I carried 85lbs of equipment in Iraq when I weighed 150lbs, and it sucked badly. Add 125 degree days and having to run with it sometimes after getting shot at or IED scares, and my knees are destroyed. Today, after loading my pack, it weighs in at 27lbs with a quart of water and 10lbs of food. That’s about what I carried on my thru hike. I could push it lower with some expensive ultralight gear, but I bought cheaper gear this time and modified it myself by sewing, cutting off excess, ect. With what I know now, there is no way I would go above 30lbs. I can live out of my pack for months at this weight, other than buying food, and am comfortable down to 15 degrees. I’m happy with that. Like you said, there are no winners in the heavy pack competition.